James Normandeau from Ronan runs in the 1,600 meter event. Charlo Lady Viking Tyra Hammond competes in the pole vault event. Arlee Scarlett Peyton Lammerding wins first place in the shot put event. 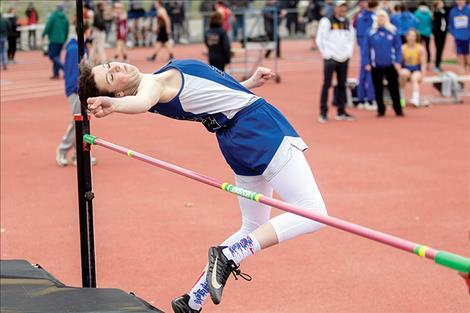 Mission Lady Bulldog Afton Brander competes in the high jump event. 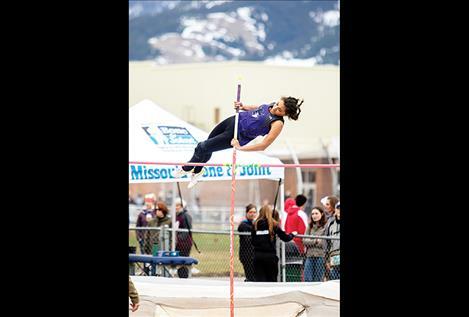 MISSOULA – Five Mission Valley area high school track and field teams competed against more than nineteen Western Montana prep teams at the Frenchtown Invitational track meet in Missoula on Saturday. The Charlo Lady Vikings finished second in the girls’ overall standings with a score of 59 points. For the Lady Vikings, Kaitlin Cox captured two titles with a winning time of 16.92 in the 100-meter hurdles and a 34-02 jump in the triple jump. The Vikings placed thirteenth. 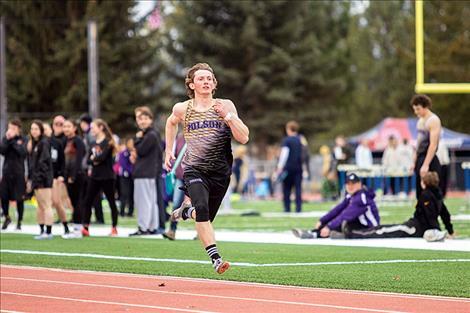 Wills DeGrandpre was the top finisher for the Vikings with fourth place in the 1,600. The Arlee boys and girls squads both placed fourteenth overall. 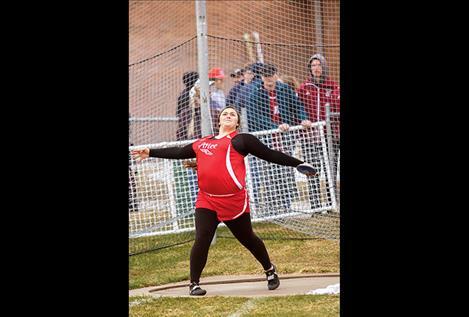 Scarlet Peyton Lammerding won the shot put competition with a winning mark of 35 feet 07.50 inches. 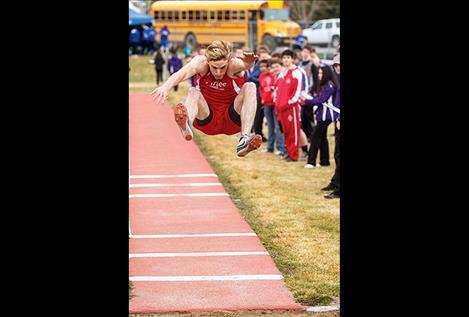 Warrior Garrett Stringer was the top finisher for the boys with a fourth place in the long jump. Mission Lady Bulldog Sydney Brander paced the pack with a bronze finish in the triple jump. 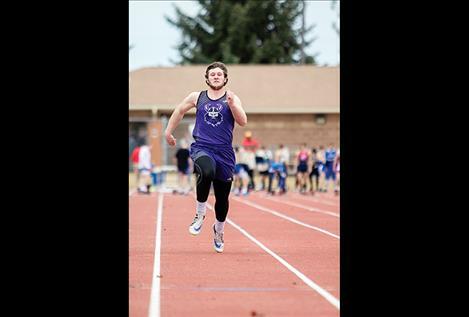 Maiden Kinsley Barney placed second in the 200-meter and third in the 100-meter. Lady Pirate Mikaela Ducharme finished third in the long jump. 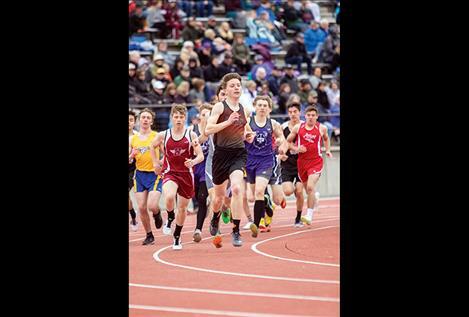 On the boys’ side of the track, Ronan Chief James Normandeau finished fifth in the 1,600 with a time 4:50.80, and the Polson Pirate 1,600 relay time was in sixth place. 100 hurdles: 1, Kaitlin Cox, Charlo, 16.92; 2, Carlee Fryberger, Charlo, 16.96; 6, Allie Delaney, Charlo, 17.37. 400 relay: 2, Charlo, 53.12; 6, Ronan, 54.91. Long jump: 2, Kaitlin Cox, Charlo, 15-08; 3, Mikaela Ducharme, Polson, 15-06; 5, Sydney Brander, Mission, 15-00.50. Triple jump: 1, Kaitlin Cox, Charlo, 34-02; 3, Sydney Brander, Mission, 33-02; 5, Carlee Fryberger, Charlo, 32-05.50. Shot put: 1, Peyton Lammerding, Arlee, 35-07.50. 110 hurdles: 5, Garett Vaughan, Charlo, 17.59. 300 hurdles: 5, Landers Smith, Charlo, 44.29. 1,600: 4, Wills DeGrandpre, Charlo, 4:50.27; 5, James Normandeau, Ronan, 4:50.80. 1,600 relay: 6, Polson, 3:46.64. Shot put: 6, Landon Lynch, Ronan, 42-06.